Q: I’m doing a paper on Michelangelo’s Pietà. Is there any Biblical reference to a time when Jesus’ dead body would have been held by Mary in mourning? Does this popular art theme have any written (Biblical) basis or has it been “conjured up” by the faithful? 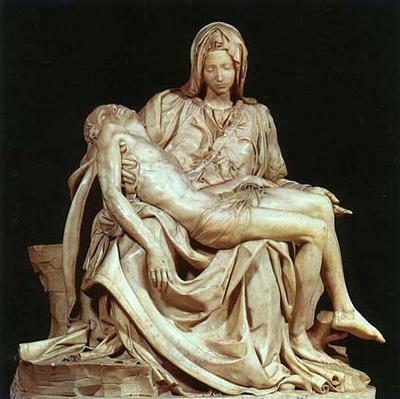 A: For the readers who don’t know the word, a pietà is a statue or other art showing the Virgin holding the dead Jesus. We know that Mary was present at the Crucifixion (John 19:25-27). She may have stayed with her Son until His death or she may have left, unable to bear more pain. Most likely, she was there to the end, finding in this watching — especially the final wound to His lifeless side — the bitter fulfillment of Simeon’s prophecy to Mary in the Temple: “A sword will pierce through your own soul also. (Luke 2:35)” It may well be that she held His lifeless body in her arms before Joseph of Arimathea and Nicodemus took Him to his grave, but we have no Scripture that tells us this. A pietà is then, as you suggest, a representation by the faithful of a mother — the holy Mother of God — overwhelmed by love and grief at the unjust death of her Son. So also, we may use it in our devotional thought to remind us of our own grief at the Savior’s death, especially since it was for our sins that He was crucified. Who is the creator of this particular piece of beautiful art? This particular Pietà is that of Michelangelo. If you search Google images using "pieta" as your keyword, you'll find an outstanding array of such art. If you saw The Passion of the Christ, you'll recall the onscreen pietà immediately following Jesus' removal from the cross. Not totally unique, but still quite rare, that rendition had the Holy Mother looking not down upon her Son but outward. In so doing, she was both inviting us to share her pain and leading us to realize our own culpability in His suffering and death. What story does the Pieta tell? It is not "the Pieta," but one of many, many Pieta's since the end of the Gothic period. Michelangelo's masterpiece just happens to be the most famous of them. If you do a google search for Pieta, you should come up with plenty of examples.